Talga Resources has provided an update on initial benchmark testing of its graphene in Lithium-ion batteries, manufactured at the Warwick Manufacturing Group’s Energy Innovation Center, University of Warwick UK. Following successful tests of the Company’s micrographite product, Talga announced its intention to move towards testing its graphene nanoplatelets (GNPs) as the active material of Li-ion battery anodes. Preliminary test results are highly encouraging with Talga's material exhibiting outstanding electrochemical performance that reportedly surpasses capacity measures for commercially available graphite anodes, delivering up to ~27% more energy density. The tests also showed low capacity losses (reversible capacity >99.5%) and high stability (coulombic efficiency 99.9%). 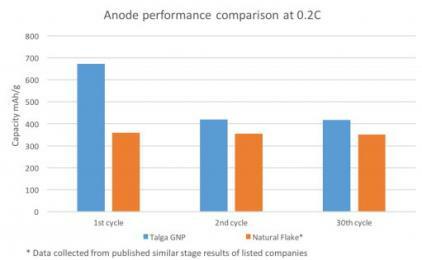 Talga also reports that the results were achieved using its bulk graphene nanoplatelets, rather than few layered graphene materials (FLG), which raises potential to compete at today’s anode market cost structure. Talga stated that the test results demonstrated that not only does its GNP anode performance prove equal or better than similar graphene testing results found in literature, but also show performance that substantially exceeds that of typical spherical or synthetic graphite that comprise of highly processed materials. This is significant as the Talga material was not optimized and received minimal processing and no coatings prior to testing. Talga’s next step is to develop and test environmentally friendly aqueous formulations for application on large roll to roll coaters commonly used in today’s battery manufacturing processes. Following this, larger scale ‘pouch cells’ will be created using WMG’s manufacturing line and dry room facilities. Pouch cells are a ‘flat’ Li-ion battery form for assembly of automobile, home power storage and other larger scale applications. Future work will see further analysis to demonstrate batch to batch consistency and endurance performance. Several partnership opportunities to develop Talga’s material for European and Asian Li-ion battery end users are being assessed. Earlier this month, Talga announced a funding initiative to raise gross proceeds of $12.3 million AUD (around $9.2 million USD). In May 2017, Talga announced impressive initial concrete prototype strength results from trials undertaken at the commercial concrete/cement laboratory of Betotech Baustofflabor in Germany.